Paraffin is used in a conventional treatment in which wax is applied to a body part, usually an extremity, as a heat treatment. used almost exclusively to warm up hands prior to exercise. - Severe peripheral vascular disease. 1. 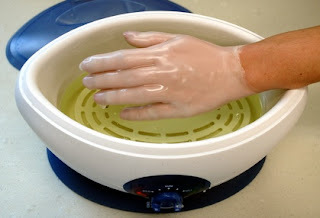 You will need paraffin wax, mineral oil, double boiler, or model paraffin bath, and a thermometer. 5. Wash hands or feet thoroughly with soap and water. 7. Hold hand in a still position, dip to the wrist, with the first being rapid and deepest. 9. Repeat 5-10 times until a wax glove is formed. Do not move the fingers or the glove will crack, which will cause the glove to cool too fast. 11. Remove the wax by running your finger through the glove and peel it off. 12. Return the wax to the container.